I am not sure if McD is coming to Madurai though their prospects at Madurai look really good. please say me wt are the upcoming malls in mdu??? Last edited by jemniv on March 30th, 2014, 3:33 pm, edited 1 time in total. Thanks for bringing the update. Hope you would bring more and more updates from Anna nagar/KK Nagar area and Madurai as a whole. Jewelone is going to open their showroom in madurai soon..
Is "The Chennai Silks" going to open a Big Showroom in Madurai at Thangam Theatre complex? ijust noticed some ads in the local cable t.v channel. Can any one confirm and post more details about it please? They'd left almost half of the total land as vacant in such prime location..Not sure if it is for Parking (or) they have some other plans. Personally, I feel the Site is very bad selection for such a massive showroom. They could have better opted KK nagar, Anna nagar, Gokhale road (or) By-pass road. yes indeed, it is a very congested location and access would be difficult. but the fact is ,after much ado and dragging its feet for so long , somehow realizing the proven potential of our city "Madurai' and its flourishing trade, thay too want their share. so let us welcome the newcomer "The Chennai Silks'' to MADURAI and hope another big showroom too is opened up here. It was a wonderful raining evening (yesterday). Had a short drive to Cafe Coffee Day @ Vadipatti. Offering a wide range of sports equipment, Decathlon has become the one stop shop for the Madurai’s sports lovers. Decathlon, the French large-format sports-store has opened its doors to the temple city, with its third outlet in the State. 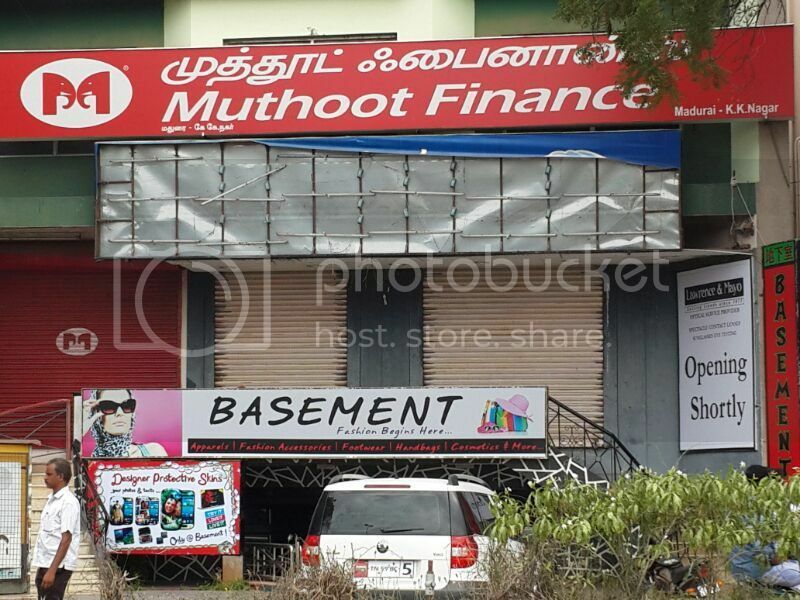 Barely five months old, the 20,000 sq.ft store at Uthangudi has become the numero uno place for all sports needs. With hundreds of products for over 50 sports and indoor games, Decathlon attracts anyone from kids to adults. The USP of Decathlon is the experience it offers to customers. The store contains a skating ring, a basketball court, a tennis court, a cricket pitch, volley ball court and a multipurpose playground for people to try out the products. The products are innovative, says Nikhilan, a third grade student who is a school champion in skating. “This is the only place which has skating shoes that can be converted to a single line of four wheels from double line. The shoes come with a tool kit to change the wheels.” Some of the sports Decathlon offers products and services for are, trekking, running, cycling, fitness, cricket, football, hockey, badminton, skating, fishing, target sports such as archery, dart boards and shooting, indoor games like carom boards, chess, table tennis and niche sports like Golf, swimming, surfing, horse riding, race biking and other adventure sports. Decathlon’s range of racing cycles/bikes has really caught on among adventure cyclists. “We have sold three pairs of cycles costing Rs.1,00,000 each, so far. Apart from city people, we also get customers from other southern districts,” says Harish. “In south Tamil Nadu, this is the only store where you can get half-a-dozen varieties of hiking jackets, tents and camping equipment,” says Ramachandran, a trekking enthusiast and a race biker from Sivakasi. “We are a group of road bikers and organize racing events every two months. The opening of Decathlon in Madurai has come handy for us. We need not go to Bangalore or Chennai to buy the cycles anymore.” The store has a cycle station that provides exclusive services and repair for the high end cycles. There’s customization, styling and other mechanic services offered. very good indeed , the decathlon sports goods showroom at madurai. in the same length wish our Maduraiites soon commence "Automobile sports club" and a dedicated racetrack. our city too has its own share of Racing / biking enthusiasts. if not sounding too ambitious,k we certainly need a worthy cricket ground . wish more good things to happen to Madurai. Could forumers inform if " Saravana Selvaratnam Stores" has opened it's branch at Madurai. if so , then it's location please?